Fisherwomen: Do we really consider the complex and varied role women play in fisheries? 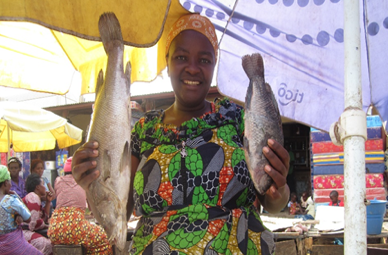 Women play a complex and varied role in fisheries. All over the world many women rely on fisheries for their livelihoods. Alongside this, many fisheries around the world rely on the roles of women for their survival. Given this, all policies in relation to fisheries concern, and impact women. But do we really consider these roles? And do we REALLY consider the gendered implications of fisheries policies? The FAO estimates that globally over 50% of the total fisheries workforce is comprised of women. But I’m not going to list you any more figures. They just wouldn’t be accurate. Still today, the data we have in relation to women in fisheries is poor (to say the least). In some countries fisheries employment remains aggregated with agriculture. In most countries fisheries employment is not gender disaggregated – particularly, in capture fisheries. I’m not sure if there is any country that collects data on women’s more indirect contributions to fisheries. All over the world women are active in all aspects of fisheries, and along the entire spectrum of the fish value chain. They are directly involved in fishing, harvesting, capturing, farming, processing, selling, and management. They also make up the vast majority of consumers. Along with these direct roles, women also contribute in many more indirect, or unseen ways to sustaining fisheries all over the world – particularly smaller scale operations. Indeed, there’s little doubt that many small and medium scale fishing operations wouldn’t succeed without a woman who is responsible for book keeping, paying wages, buying food for the boat, helping to mend nets, picking up spare parts, finding crews, bailing out the boat, keeping the house running, rearing children (and having them), and often working outside the home also. More generally, we know that in most/almost all countries women spend an additional 1-4 hours per day, in comparison with males, on household ‘duties’ – when you consider all of the other roles I have just listed I would suggest that for the wife/partner of a fisherman this is much more. Given these complex roles, of course fisheries management policies directly (and indirectly) impact on women. Strategies that aim at the economic rationalisation of fleets, or lead to a loss of place based fishing impact on women. Agreements, and ventures that divert local fish supplies to alternative or export markets impact on women, and in developing countries certainly, on household food security also. In Iceland the introduction of the ITQ system and the resulting shift of quota away from rural communities, has led to a direct loss of women’s livelihoods, to increased economic insecurity at the household level, and to husbands and partners being away at sea for much longer. Indeed, policies such as these, often leaving wives or partners, and entire families at home, in one way or another, and in some cases for weeks at a time (which I suspect is no joke if you have a young family) – certainly have gendered implications. ITQ’S and Iceland is just one example – I could have used Denmark, or any country in the EU, and any policy that seeks the same objective, to highlight the gendered implications that policies aimed at the economic rationalisation of fleets can have. In developing countries the gendered impacts of fisheries policies can be altogether more complex. In Senegal, the activities of foreign fleets in operation along the West African coast, alongside foreign processing plants within the country, has resulted in diverting the supply of fish (physically, and through increased prices), from artisanal fish processors (predominantly women), with a knock on effect on the livelihoods of these women, and subsequently on their families. Often these activities are grounded in previous colonial ties, existing trade structures and so on. I could insert many West African countries in that sentence instead of Senegal, and the reality would be broadly similar. While their roles are complex and varied, and they face both the very general challenges that go with a life at sea, alongside an array of specifically gendered challenges – arising from their ‘gendered space’ – women in fisheries have also shown themselves to be very adaptable. (Who can survive in fishing if they’re not adaptable?). In response to policy shifts (among other factors), their roles are evolving. For some women this has meant becoming boat or quota owners, for others becoming innovators, and for others still becoming more politically active. Despite this, unfortunately, it seems that women and their needs are still fairly marginalised in fisheries (as elsewhere). The reality is that it remains that case today, as it seems to have for most of the past decades, in spite of the multitude of roles they undertake, and the essential contribution to the functioning of a fishery they make, that the roles of women within this industry, are still not adequately considered, and in capture fisheries specifically, women remain, in many respects, especially unseen. Furthermore, despite the very real implications that fisheries policies have for women, I’m not sure if they are adequately considered by policy makers, or by researchers of fisheries policy generally. (Speaking less generally there has been some really good, targeted research done on the roles of women in fisheries, and their challenges). Indeed, some of the biggest pieces of fisheries legislation, until recently, failed to mention women at all – for example the 1995 Code of Conduct for Responsible Fisheries. Fortunately, this is getting better and The Voluntary Guidelines for Securing Sustainable Small Scale fisheries, and The Voluntary Guidelines on the Responsible Governance of Tenure explicitly lay out commitments to gender equality. Turning to the European context specifically, and considering the main body of the CFP – there is no such explicit commitment made. In this context we have to consider not only women in European fisheries, but also the women involved in fisheries in many developing countries, with whom the EU signs third part agreements with, as part of the external dimension of the CFP, and from where a sizeable proportion of the fish that we here in Europe eat comes from (and which I have touched on above). Recently, I had a colleague (thanks Shaheen!) run some basic text analytics for me on the legal documents pertaining to the most recent CFP. I also had him run the same analysis on the 2012 Commission’s Green Paper on the Reform of the CFP, along with the protocols pertaining to two fairly recently agreed Fisheries Partnership Agreements signed with developing countries, in one of the poorest regions of the world – Mauritania and Senegal, in West Africa. We searched these legal documents for the terms ‘gender’, women’ and ‘woman’. 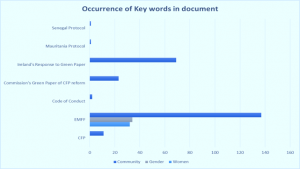 Each of the documents yielded 0 results for these keywords – they do not come up once. Of course, this is not simply an issue at the EU level, we also searched Ireland’s Response to the Commission’s Green paper and got the same results (Figure 1). While women and gender are included in the documents pertaining to the EFF, and EMFF (women: 32, gender: 34), it is still baffling that there is no mention in the primary document that dictates how European fisheries are managed. Sure, maybe now we are mainstreaming gender through all European policies – but I still feel, that given the particular challenges faced by women, and that have been highlighted time and again to policy makers, that it’s a bit mad that women are not explicitly mentioned in the CFP document. And, of course, this isn’t just a policy issue. This trend is also visible in academic publications (Figure 2). As I said earlier – there has been some really good, and fairly solid work done on women in fisheries within academia. However, in total, this work is still fairly marginal. Quickly searching Science Direct using the search terms: ‘marine policy’, ‘fisheries’, ‘fisheries management’, and ‘fisheries policy’ returns 133,932 results. Analysing the text of the first twenty of these hits shows that gender/women only comes up in three of them. If I further include the term ‘gender’ in my search, the returns diminish to 7307 texts, or instead the term women – 4134 results. When I change this to man the figure jumps again to 27627 results. (Yes. I am aware – not very scientific, but still it is telling). 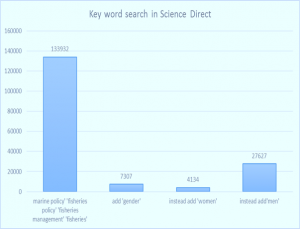 Why, so often, are words like invisible, discounted and ignored still highlighted/applicable in relation to the roles of women within fisheries? I suppose, fairly generally (and as has been stated by a couple of authors on this blog), we don’t seem to prioritise the social aspects of fisheries – the focus is very much on the biological and economic aspects of this activity (sigh)! Certainly, part of is it grounded in the fact that, despite all of these roles – we tend to take a rather dichotomous view of fishing activities, and then fail to also consider the relatedness of this activity, and all of its components. Very often the role of fisherMAN is seen as just that – a role played by a man, in isolation. Which doesn’t really make sense does it? Aside from the very real fact that women in many places do fish – go look in Galicia at the women who carry out the backbreaking work of harvesting shellfish from the shore, or go out to sea on their own boats, or go to Iceland, and meet the women that work on boats there – even on huge factory trawlers (these are just two examples I could go on) – the reality is that the non-economic roles that enable a boat to go to sea, and other aspects of the value chain are fairly crucial aspects of fisheries, and both certainly required to having fish land on your plate. And yes, many women are concentrated in these spaces. They are still very much involved in fisheries! 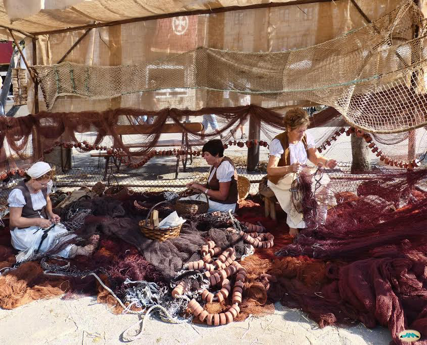 A further contributing factor arises from the fact that many of the non-economic roles that are essential to the operation of a fishery are carried out by women. Unfortunately, we live in a society where non-economic roles count for little – they are neither recognised nor valued. Further still, maybe their concentration in smaller scale operations is where the problem lies? A lot of women are positioned in a subsector that very often the policies we follow seem to discount or ignore. In this respect, you could argue that women (yes, still today) are a group suffering from a fairly poor ‘power positioning’, and further many of them are concentrated in a subsector that itself suffers from a poor ‘power positioning’. In reality, and in the very least, it is a culmination of all of the above. However, discounting the roles of women is probably not the best way to 1. Achieving gender equality 2. Meeting any real sustainability goals in relation to fisheries, food security and so on. The content of this blog does not reflect the official opinion of the SAF21 project or of the European Union. Responsibility for the information and views expressed in this blog lies entirely with the author(s).